This beautiful, handmade birthday greeting card represents lovely lilac lady which symbolises love,tenderness, romance and love. Handmade birthday greeting cards from e-store Unikatnica make truly a unique and memorable gift for any special occasion. 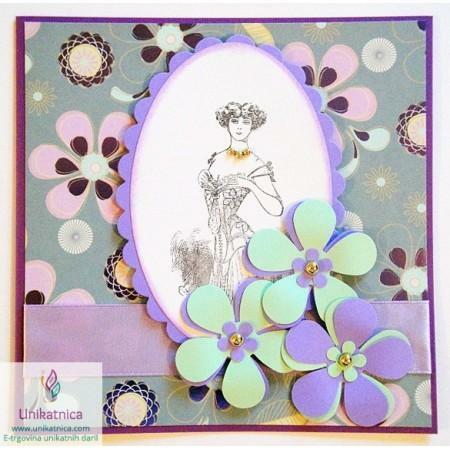 Unique, hand-made Anniversary and Birthday Card with lilac lady motif. The lady motif gives this birthday greeting card a kind of retro-vintage feel and is made from different finest materials with versatile textures. We can make a birthday greeting card with the same lady and texture motif in different colours by your request.